Visitors to the station will have noticed that the bed to the left of the exit gate is now filled with plants and a boxed in cherry tree. 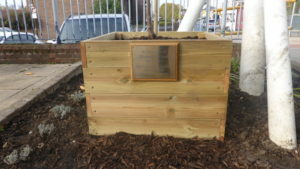 This has been planted in memory of Elaine Picton (1950 -2017), who lived locally, was a founder member of the Central Charlton Residents Association, a keen gardener and an early supporter of Charlton Community Gardens. She is much missed, particularly by her children, grandchildren and husband, who felt that a commemorative tree, planted locally, would be an appropriate memorial to her. The bed was cleared and planted up by her family with help from company workmates of her son. Barbara Holland, a local associate of CCGs, also helped with the design and development of the plot. Thank you for facilitating this. What a very fitting memorial to a wonderful lady. Elaine is missed by many and the tree will be a constant reminder to us all of her, the power of communities and the good people who give freely of their time for the benefit of all. I look forward to seeing the tree grow and bring joy to people in our neighbourhood. Elaine brought joy into the lives of so many. RIP.